So you’re considering an influencer marketing campaign for the first time…what’s next? Travel Mindset Creative Director Jade Broadus believes forging and maintaining effective brand relationships is crucial to a successful influencer marketing campaign. 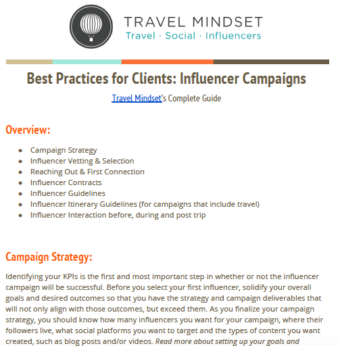 From campaign strategy to itinerary creation, an influencer marketing campaign is more than just targeting your brand’s KPI goals. It’s about fostering long-term brand ambassadorships.